A visit to the St. Petersburg Russian Restaurant in Manchester is like leaving the UK and being transported to Russia - an experience, which shouldn’t be passed up. 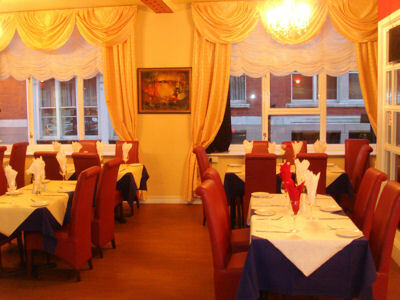 Opened in November 2007 on Sackville Street, just around the corner from both Manchester Piccadilly Station and The Palace Theatre, this is St Petersburg's second restaurant. Their first, in Liverpool, has won rave press reviews and was highly commended in the category 'Best Liverpool Restaurant' by Cheshire & Lancashire Life Magazine’s Food & Wine Awards. It's also popular with celebrities, tennis stars and football players as well as the odd Hollywood movie star, even being used as the film set of Sparkle, starring Sir Bob Hoskins. With the west Russian city of St Petersburg being Manchester's twin town, it seemed logical that the Liverpool restaurant would be responsible for the first ever Russian restaurant in Manchester. 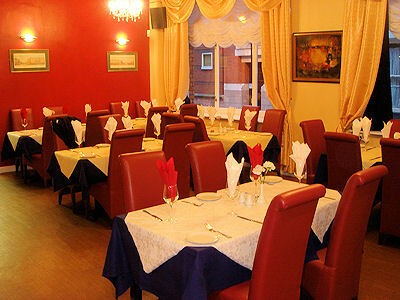 St Petersburg Restaurant in Manchester has a great selection of homemade, nutritious, authentic Russian dishes, many of them are very normal to the traditional British palette. 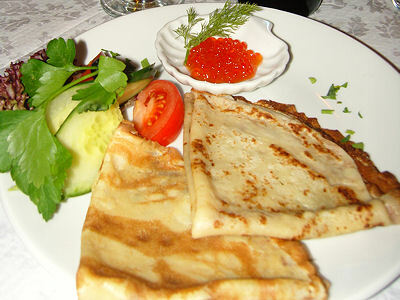 With a menu boasting traditional homemade Russian and Ukranian soups, tasty hot savoury Russian pancakes (Blini's), Stroganov's and famous Beef Goulash. There's many lamb, chicken, vegetarian and fish dishes to choose from with Sturgeon coming highly recommended, not least because of it's own delicious taste, nor the fact it's the most expensive fish n the world, but it also produces the best black caviar. Talking of caviar, try the famous Russian Black or Russian Red Caviar, served on either a boiled egg with a special filling or with three Russian Blini Pancakes. 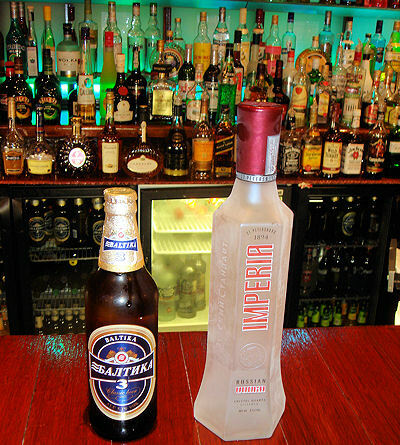 Ideally sampled with a shot of Russian Vodka as accompaniment. 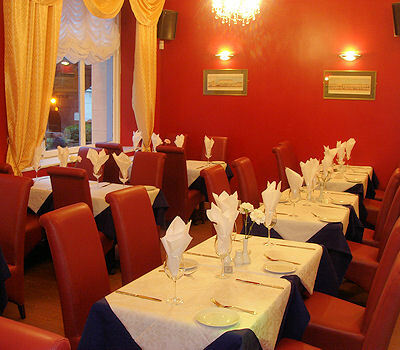 All served in a friendly and relaxed atmosphere, it is a fantastic place to have your party or a more intimate dinner. There's also top class live entertainment including Russian Cabaret, Karaoke, Disco and dancers performing traditional Russian dancing and Belly dancing every Friday and Saturday. "'What was St Petersburg called before it became St Petersburg? ', I quizzed my fellow diners. 'Ikan Cafe' was the unexpected reply I received. Very true but not the geographical answer I had in mind. St Petersburg is Manchester's twin city and if the cuisine is as good as this brand new Russian restaurant on Sackville Street, we can't wait to taste the delights of Bilwi, Chemnitz, Codoba, Rehovot and Wuhan - Manchester's other twins. Apart from being the first Russian restaurant in Manchester, St Petersburg must also be the only place in town where you can order caviar - from £4.50 for 2.5g of Red Caviar upto £55.95 for 20g of the more exclusive Black Caviar. The Blini pancakes were extremely tasty, washed down wonderfully with a bottle of Russian Baltika beer, whilst the Peter The Great steak was absolutely incredible - well worth the journey alone! Like many of the Mediterranean restaurants around town, diners are entertained with live music at weekends. 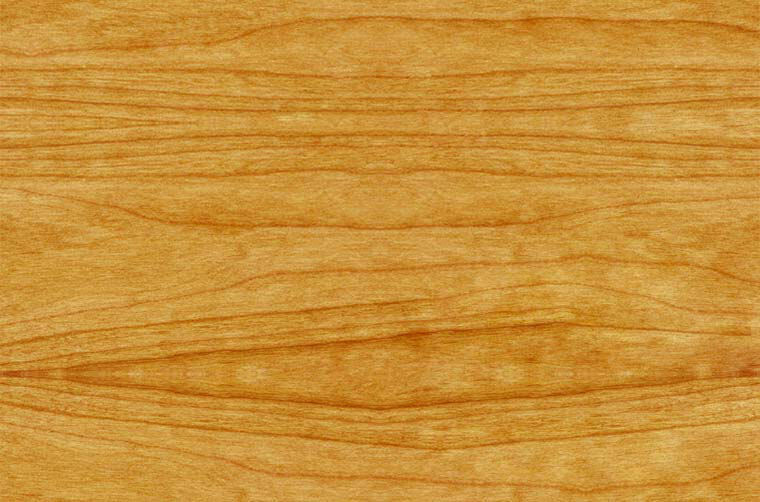 For a quieter meal go midweek and you might just bump into us - we'll be back there many times!